The mission of the Genealogical Society of Broward County is to foster and nurture an interest in genealogy by providing instruction, information, and inspiration, while encouraging Society Members and others in the development of family histories and genealogical records, for the benefit of future generations. We welcome interests on all levels; from those with an initial curiosity about family history, to those who are more advanced in their knowledge and documentation of ancestral records. We are extremely proud of our genealogical library which is maintained by the members of the GSBC, and now housed in Nova Southeastern University's Alvin Sherman Library, which is the largest library in the State of Florida. Computers are available and provide internet access for researchers. Our program topics and presenters are chosen to guide further research and provide information on other resources for ancestral studies. 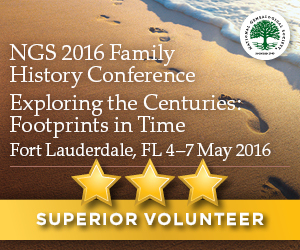 We love to share experiences and knowledge as we learn from, and teach each other, valuable genealogical skills. The Genealogical Society of Broward County, Inc., has been in existence since 1967, becoming a non-profit organization in 1977.